With 475Hp and 470lbs of torque, creating peak Hp is at 6,300 rpm's and peak torque is at 4,300. This is great all-around power package for hotrods and streetrods; torque is high maintaining a nice power band finishing up at 6,600 rpms. Idle quality is great at 850 to 950 rpms creating about 10-12 inches of manifold vacuum to run power brakes. To keep the cost down we installed a small flat tappet mechanical camshaft and roller rockers. The compression ratio is 10.5 -1 requiring the use of 93 octane fuels. In this engine combo we used a dual plane Edelbrock Performer intake manifold to keep the power band lower in the rpm band and the torque as high as possible. We have been at 490HP and 480lbs at 6,300 in a simular combination with the 355. 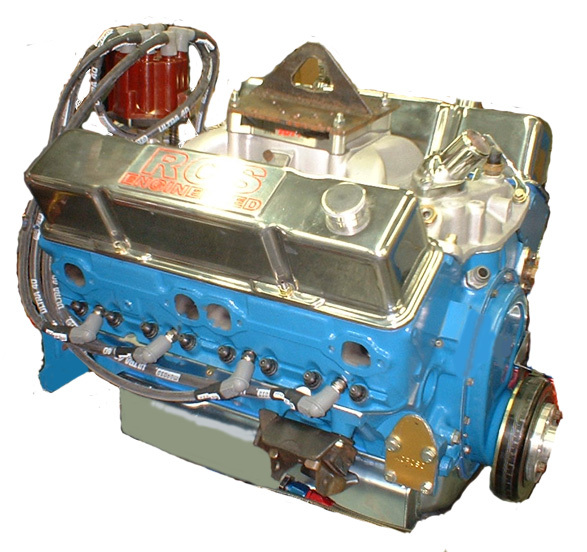 This combination uses a GM Bowtie steel head that is prepared to yeild a 173 cc intake runner after porting for maximum port velocity and fill rates.